TAXA Outdoors’ latest camper design is a lightweight basecamp, gear hauler and tent platform named after a fuzzy caterpillar. 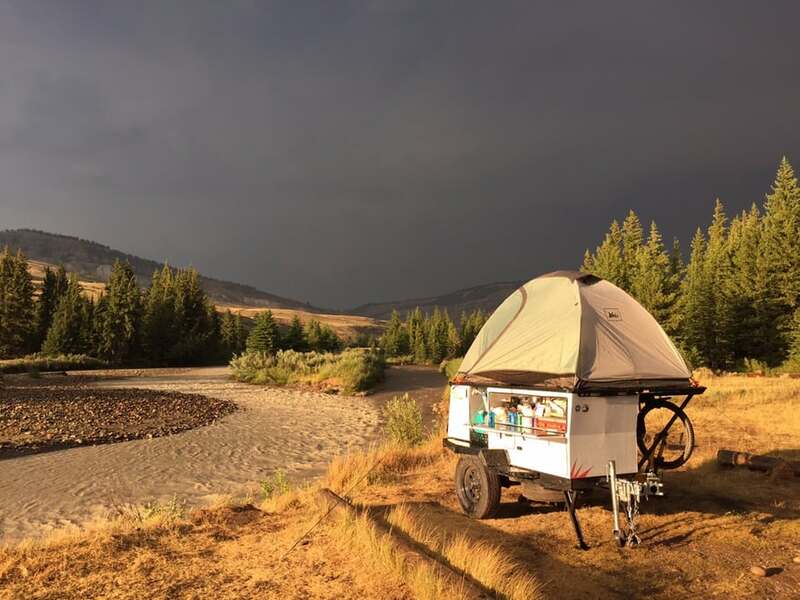 Known for designing the innovative Cricket and Tigermoth campers, TAXA Outdoors has added a new design to their trailer family. 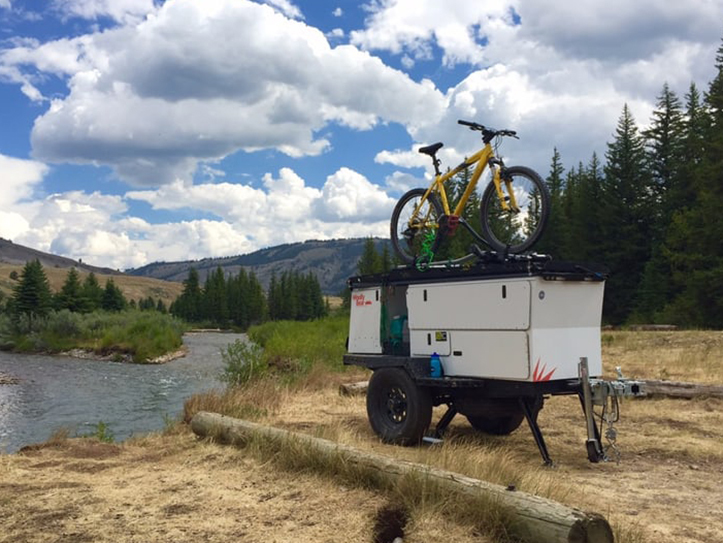 The WoollyBear is both gear hauler and basecamp in one small package. 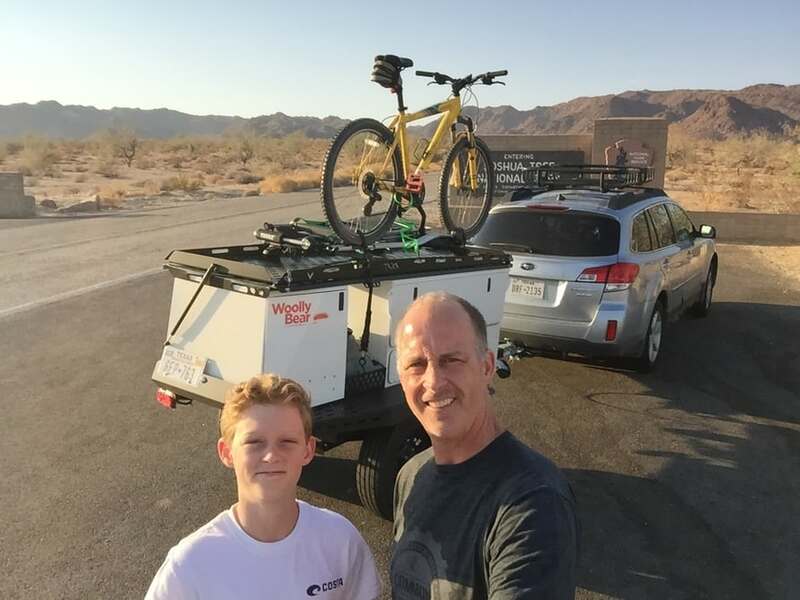 TAXA owner Garrett Finney and his son take the WoollyBear for a test drive. The WoollyBear’s dual-box body is made of powder-coated 16-gauge steel and sits on a steel frame inspired by generator trailers. Each box is only 30 inches wide and the trailer only weighs 700 lbs. 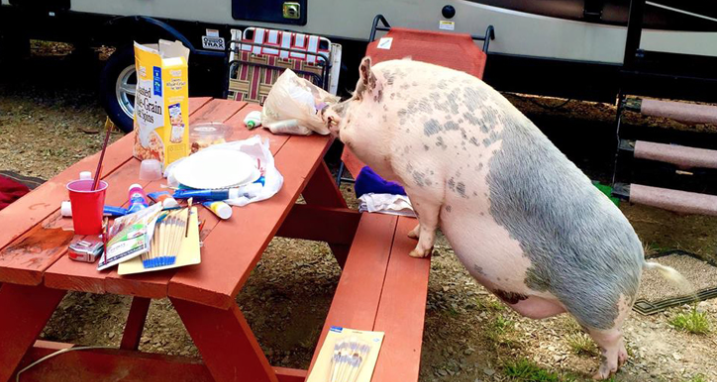 The entire trailer is just over seven feet long and about four feet wide. 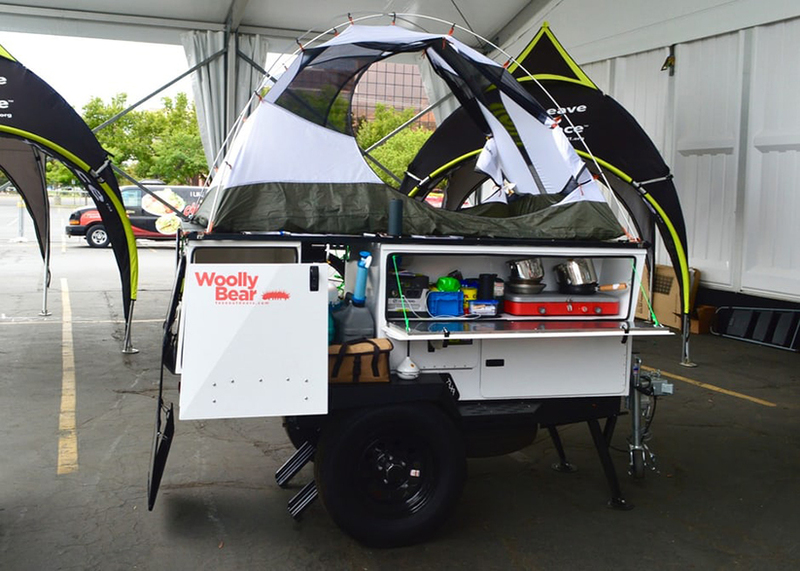 The WoollyBear is a mobile kitchen, gear box and tent platform on wheels. 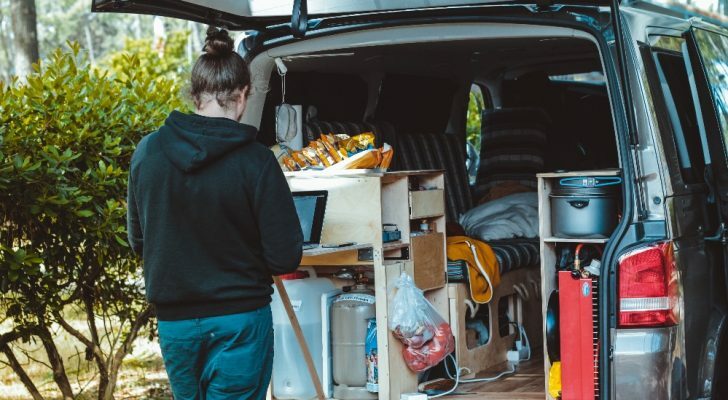 The new TAXA design features a full size outdoor camping kitchen, a pull out drawer that fits most large coolers, storage areas for food and gear, and a cargo deck that transforms from a bike or boat rack into a sleeping platform or a giant table. The platform is accessed by a steel step and can fit a tent for two people. 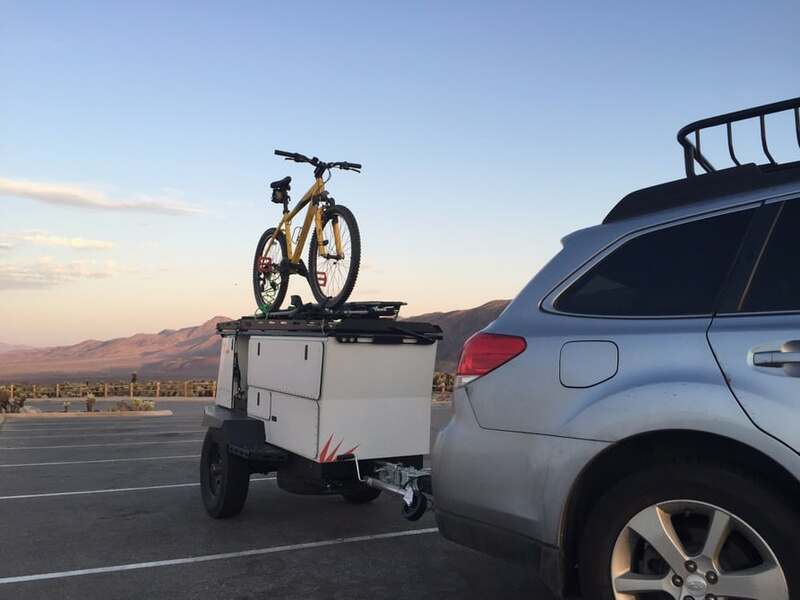 The tent platform serves as a bike or boat rack when en route to the campsite. 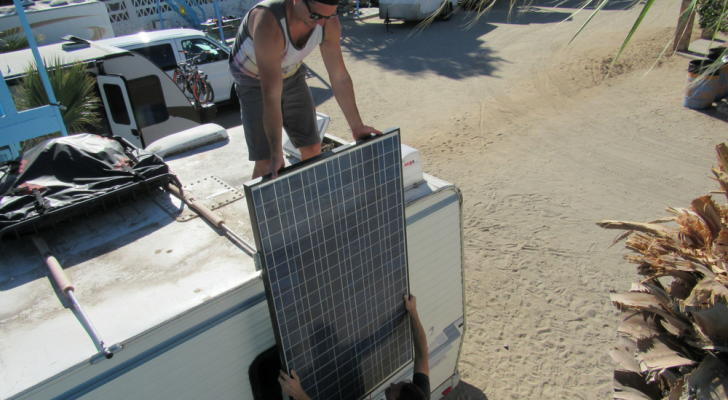 The camper even has open space to hold jerry cans, propane containers and firewood. The rack mounts on the deck let you attach any type of carrier you want. 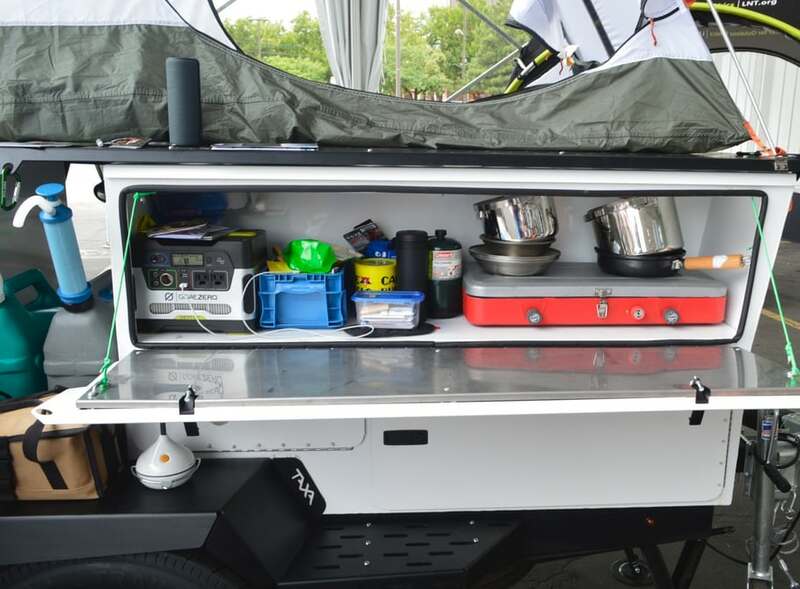 The trailer has compartments for coolers, kitchen gear and even jerry cans. After a career with NASA designing equipment for living in space, Garrett Finney, owner of TAXA, began to design unique campers with inspiration from his NASA days. The WoollyBear kitchen was inspired by NASA designs. The WoollyBear has storage inspired by NASA designs including attach points, hooks and bungees for wall- or ceiling-mounted cargo. 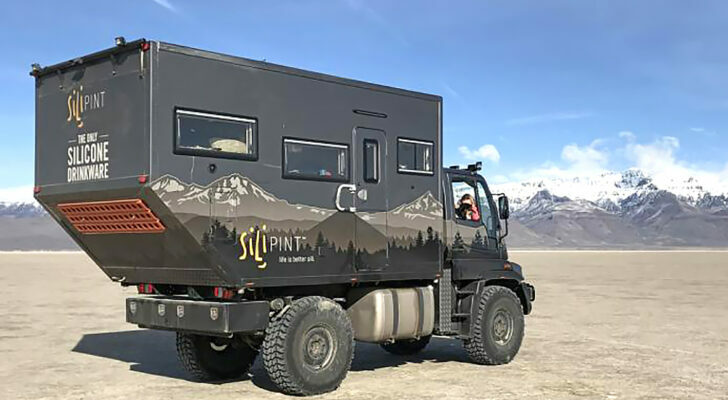 The camper also looks like an interplanetary Rover with its 12 inch ground clearance, torsion axle, and rugged 15 inch radial tires. 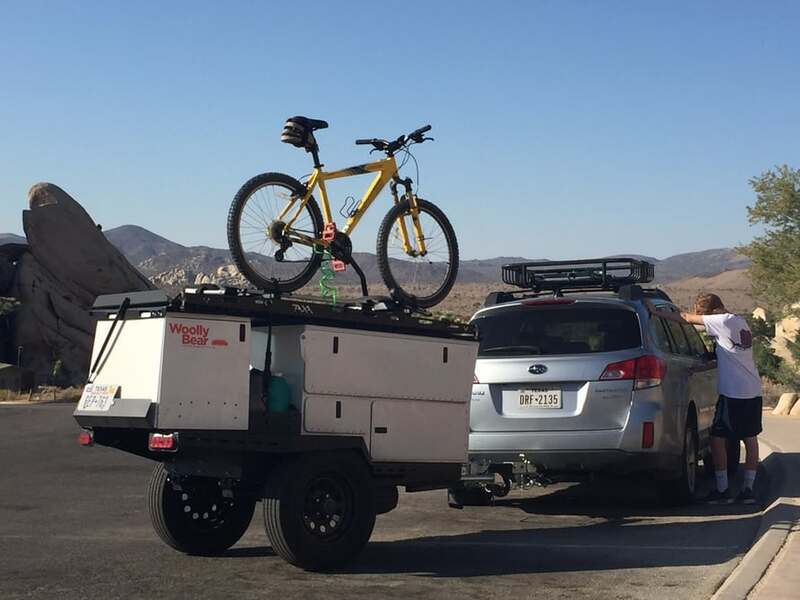 The trailer is a lightweight 700 lbs. 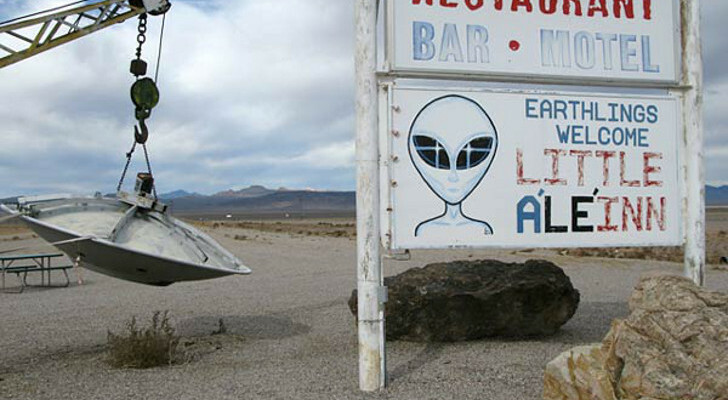 and can be towed with smaller vehicles. The WoollyBear also has some excellent safety features including electric brakes and breakaway switch, fire extinguisher and smoke detector, and a keyless interior lock. 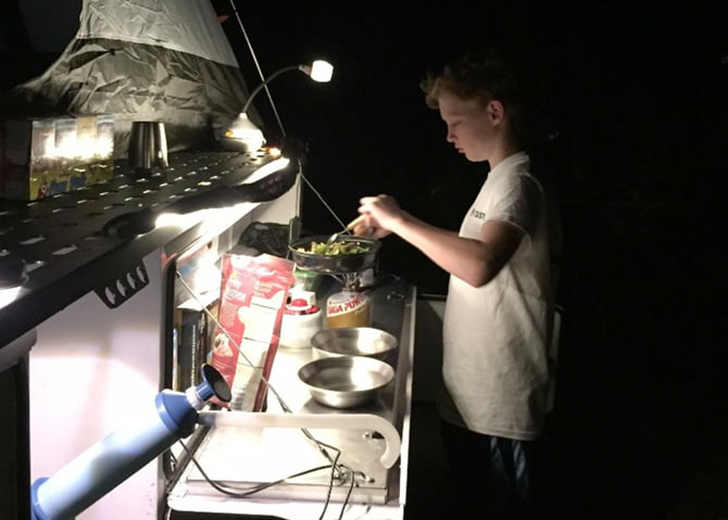 Finney’s son cooks in the fresh, outdoor air. 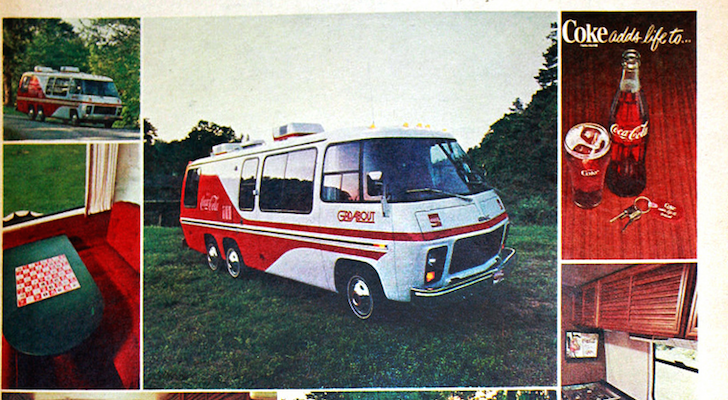 The camper’s name comes from TAXA’s insect naming convention. A woolly bear is the fuzzy caterpillar that grows into the orange Isabella tiger moth. The folding platform does give the impression of fluttering wings. The WoollyBear will be available October 2016 from dealers around the U.S. If you are interested in purchasing a WoollyBear, they are being sold exclusively through dealerships starting October 2016. Prices will depend on the dealer. 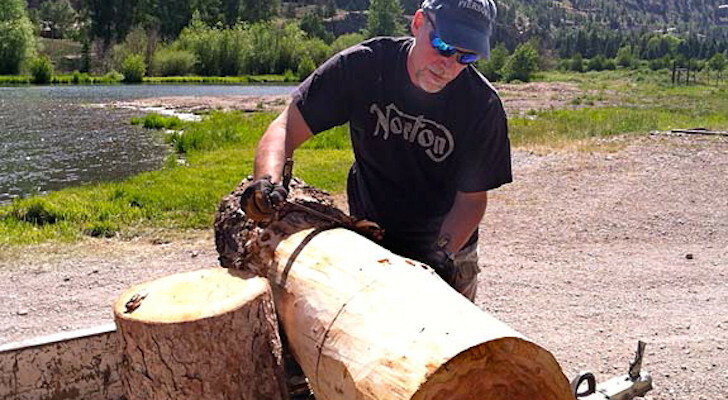 You can contact TAXA Outdoors to find this camper near you.